Feltwell Village at Feltwell01553 763044work VillageThe village has grown from its Saxon beginnings to its present population of around 4000. It is a thriving community with a small primary school originally built as a hospital. The village has two pubs, The Lodge and The West End as well as a small selection of local shops. The village lies near the border of Cambridgeshire and Suffolk as well as being close to several airbases, notably Lakenheath and Mildenhall. It is 21 miles south of King’s Lynn and 13 miles south of Downham Market although it is also quite close to Thetford (14 miles) and Ely (19 miles). 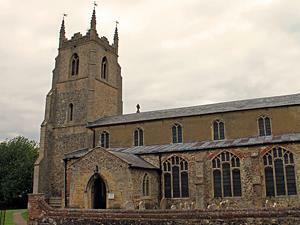 Unlike most villages Feltwell has the distinction of having two Parish Churches - one a large handsome building dedicated to St. Mary the Virgin, and the other smaller and plainer, dedicated to St. Nicholas, the Patron Saint of Travellers, Sailors and Children which is built on a small hill at the edge of the village. The village has grown from its Saxon beginnings to its present population of around 4000. It is a thriving community with a small primary school originally built as a hospital. The village has two pubs, The Lodge and The West End as well as a small selection of local shops. Feltwell is close to Thetford Forest and the National Nature Reserve at Weeting Heath.